This is a mock draft addressing the Bills needs before free agency. Note that this is going to change depending on what areas of need the Bills address in free agency. I currently see eight needs the Bills need to address. Here are the positions I hoped to fill with this mock draft: QB, RB, OL, WR, Edge Rusher, DT, LB and CB. Mason Rudolph- QB Oklahoma State- The way it looks the top four passers will be off the board by the time the Bills select. Unless someone drops into the teens I see Sam Darnold, Josh Rosen, Josh Allen and Baker Mayfield all off the board. 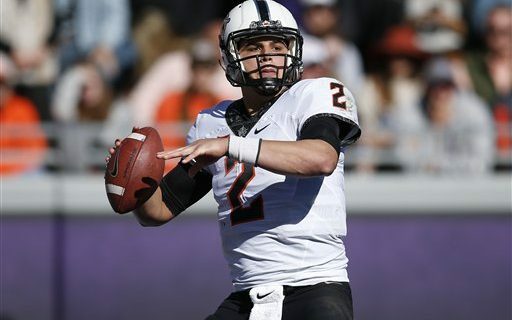 This leaves the Bills with Mason Rudolph. He’s big and a pocket passer. Bills fans will like that he’s the opposite of Tyrod Taylor. He needs to develop so he’s most likely not the starter next year. Harold Landry- Edge Boston College-Landry was supposed to be the top edge rusher coming into this year. Injuries slowed him down this year and as a result I think he slips down to where the Bills can get him. The Bills scheme needs a pass rusher with speed off the edge. Landry has great burst and speed around the edge. You don’t get elite edge outside of round one so I felt I needed to go here with the pick. Auden Tate- WR Florida State-I’ve seen him compared to Brandon Marshall and Allen Robinson. He’s a very good combination of size and speed. He was hurt this year because of sub-par quarterback play. Injuries at QB for Florida State affected his numbers. The Bills desperately need to improve their WR group. This guy can come in and play outside from day one. Andrew Brown- Virginia DT-Lived in backfield during drills at the Senior Bowl. True star of Senior Bowl! Played a lot of 5 technique in college, showed in Senior Bowl he can play the 3 technique and penetrate. Has versatility to play the 5 or 3 technique. Bills need help at DT in worst way with trade of Marcell Dareus and questionable return of Kyle Williams. Shaquem Griffin- UCF- Stud LB/S for undefeated UCF. Was all over the place Vs Auburn. Lost his hand when he was 4. His senior year 62 tackles, 10 for loss, 5.5 sacks and 2 fumble recoveries. He was one of the best defensive players in the country this year. He’s versatile which the Bills love can play all over the defense. Mark Walton- Miami Florida RB- I see great value here. Started out really hot and starting moving up people’s boards in the first quarter of the season. He’s an explosive runner a huge part of the Hurricanes success. An ankle injury ended his season early but he still had 1,117 yards and 14 touchdowns. He’s a good receiver out of the backfield too. The Bills need a RB to ease the load on LeSean McCoy. This is the guy that can make sure Mike Tolbert never sees the field again. Cole Madison- Washington State T/G- He played tackle at Washington State but I see him more as a guard in the NFL. We know he can pass protect considering the cougars threw the ball 664 times last year in Mike Leach’s Air Raid offense. He showed at the Senior Bowl he could run block as well. The Bills love versatility so I see a guy that can play guard and move to tackle if needed for a game or two. With the loss of Eric Wood the Bills need help on the offensive line. Levi Wallace- Alabama- CB-He’s the forgotten man in the Alabama secondary. Can blanket receivers. Worthy of a later round pick. Was a walk-on at Alabama in the secondary. This is very hard to do with all of the five star recruits they get. He led the team in pass break-ups in 2017 with 15. He needs to add weight but I think worthy of a later round pick.